This book was such a sweet read! And can I just say that I love that every chapter had an illustration at the beginning? So pretty! And it was something I adored about fairytale books when I was little. And I still do. 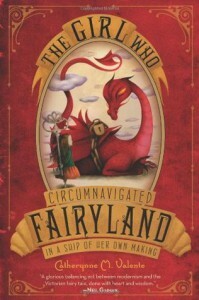 I really enjoyed this take on Fairyland and the way it works and certain rules that almost always exist in these stories. I feel a bit cryptic saying this, but I really don't want to give anything away. I loved the whole feel of it, September is a girl who can make anything happen. And she throws herself wholeheartedly into this adventure and I really liked her. And can I just say that I loved the green jacket! Is it weird that one of my favourite characters was a jacket? There was such emotion coming from it, major props to the author for that! The way she described wyverns, I pictured A-Through-L as a huge chickenlike dragon. But luckily, the picture on the cover corrected me, which saved some weirdness. I loved the wyvern and his family. He seems so lovable and I just wanted to hug him. And as a kid I would have loved having a miniature version as a stuffed animal. Oh, who am I kidding, I would love one now! I really enjoyed reading it and I love looking at the illustrations, they're awesome!